The recently published 2017 World Happiness Report says, “the happiest nation on earth is Denmark.” The Nordic Open, an international ECAHO B-show in Ikast, reflected that. 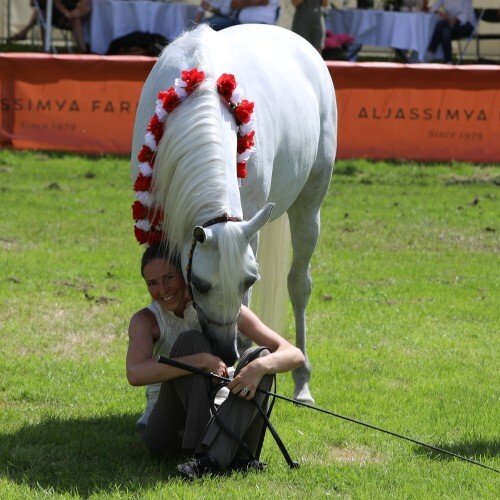 The Nordic Open Denmark is the broadest of the Scandinavian shows, which shows the versatility of the Arabian breed. 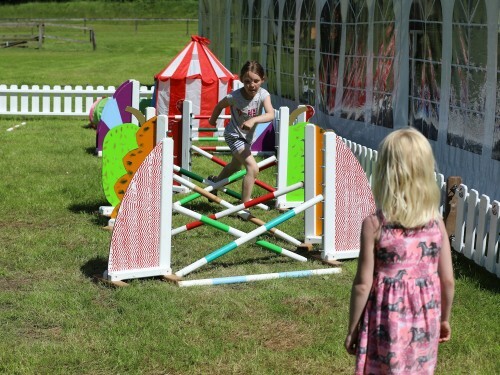 The weekend offered not only the B-Show but also a special show for Amateurs, part of the AJF Amateur Challenge, a Straight Egyptian Show and a riding event. Signe and Thomas Kirk Kristiansen, proud owners of Kirk Arabians, located in Martofte, Denmark, are passionate riders. Especially Signe is a keen dressage rider and finds Arabians ideal for this discipline; she already competed at the international Arabian horse riding event in Aachen. The couple founded Kirk Arabians back in 2006 with a clear goal: “We will make sure, the horses are as comfortable as possible,” says Thomas. Signe and Thomas run the farm together with a dedicated team. They came to the Nordic Open not only as sponsors for the All Round Cup Reward but also with four horses to compete in dressage. Kirk Arabians was well presented with Zox Sherlock and Zox Sherman, both with Marie as pilot, Abha Mahdi and Signe, and Tinkerbell Eg with Thomas as a rider. They returned with a bunch of rosettes! Maybe the highlight was Signe and Abha Mahdi’s first place in MA1 dressage. 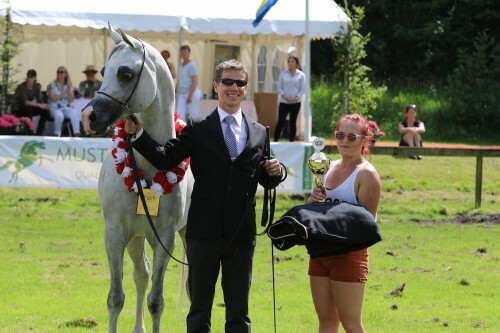 The All Round Cup Reward was given to 1999 born Demir and his young rider/handler Helena Byrne. Helena presented this lovely bay Vympel grandson beautifully in-hand and in dressage. 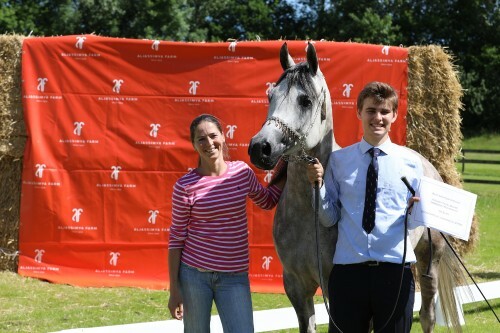 Koen Hennekens, Holland, enjoyed a fantastic AJF Amateur Show and received the second title for Best in Show Experienced. Altogether Koen received three first places with Emirzo in experienced geldings, Ebenos in experienced stallions and MP Jawa Ajf in experienced junior fillies. With the Michalow bred Emirzo, by Enzo, Koen became Best in Show Experienced Amateur and received the highest total score in harmony. Best Danish bred horse became Dixie Isa, bred and owned by International Sports Arabians (ISA) Stud. The 2011 born grey Dixie Isa received 90,5 points in her class. She is by the Mosalli son MD Tallal, himself Israel National Champion, out of Drimea, by Medalj. RFI Farid is the sire of Gold and Bronze Champion Junior Filly. Gold went to MS Mary Lynn out of Mary Lou, bred and owned by Malorny Arabians, Germany. The grey filly combines WH Justice and Thee Desperado on the female side of her pedigree. Marianne and Ole Ladegaard of Al Waha Arabians, Denmark, are the proud breeders and owners of Bronze winner AWA Wadi’ah out of AWA Wasimah. Silver went to Gallileah, by Espekt, bred by Nordlys Araber, Denmark, and owned by Polia Arabians, Poland. The Hennekens family was also successful in the B-show. Peter Wilms showed their young stallion Ebenos, by Om el Bellisimo, to Silver Champin Senior Stallion and the three years old colt MM Esperado to Gold Champion Junior Colt. MM Esperado, bred by Mario Matt Arabians, Austria, is by RFI Farid out of MM Eluise, herself Austrian National Champion Filly and out of a full sister to European Triple Crown Winner Essteem. Lawrence El Gazal is the sire of Silver winner Dantae El Lawrence, bred and owned by Asilah Arabians, Denmark. KI Kamal Khan, by Ali Khan, received Bronze. This grey colt is bred and owned by the Danish farm Kida Arabians. European Triple Crown Winner Ekstern fulfilled the requirement of a great stallion: that the exemplary record in the show ring be matched by the accomplishments in the breeding shed. The Gold Champion Senior Mare Suzanna is just one example of Eksterns exquisite potential as a sire. Bred by DB Arabians, Belgium, the grey mare is owned by Agmal Arabians, South Africa. Suzanna won the class of 11 years old mares with grace and received the highest points of all mares and fillies (92,5). Another Polish bred treasure, Eliksja by Esparto and out of Ekspulsja, achieved Silver. Eliksja is bred by Michalow, Poland, and owned by Vineyard Arabians, Slovenia. The Bronze winner, Lothara Bez by Lothar El Nyhl and out of Nag Olla Bez, was bred by Otto Berg, UK, and is owned by Mette Bak, Denmark. Gold Champion Senior Stallion Elgast cannot deny his sire, the champion maker WH Justice: huge eyes, finely sculpted ears and face, a proudly arched neck. Elgast dam is the Psytadel daughter Elfera and traces back to Milordka (1810). Lech Blaszczyk, Slovenia, is the proud owner and breeder. Aforementioned Ebenos achieved Silver with the Gazal Al Shaqab son Lissar, bred by Michalow Stud and owned by MK Equine, Denmark, winning Bronze. It was a great show with a wonderful atmosphere. No wonder, Danish people are not only the happiest on earth, they are also amazing hosts. A heartfelt thanks goes to the breeders, owners, trainers, riders and handlers and to all the generous sponsors, especially to Aljassimya Farm and Kirk Arabians for inviting the Arabian Horse Global Network to Denmark!